I recently made my first homebrew contribution. homebrew is a package manager for osx much like yum/apt-get and the like you know from linux systems. Since this may not be the last time I did this or have to do this I will elaborate what the workflow was. This may help me remember and others get a grip how to do that the first time. I am using the freeimage library in lot of my projects and since it turned out to be pretty hairy to build this lib on osx by hand I tried to find it in homebrew. 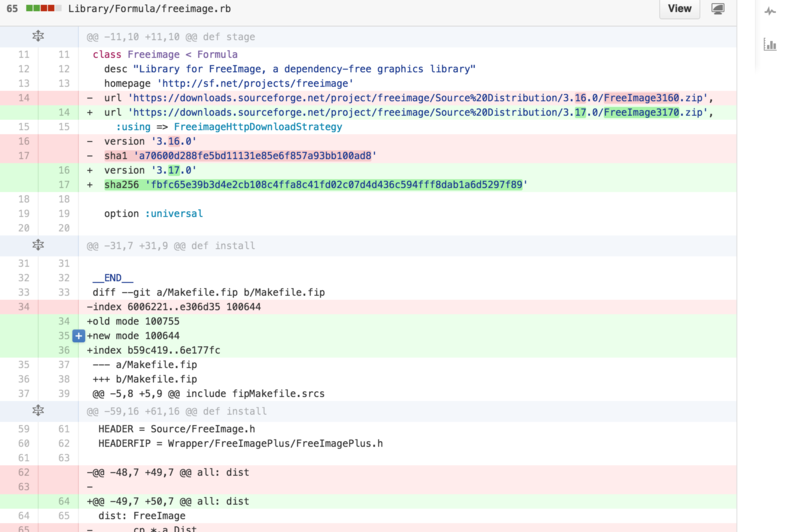 Unfortunately the freeimage formular was a bit dated and just supported version 3.16.0. Since I needed the most recent version I opened a ticket for version 3.17.0 on github: issue #41609. After looking into the formular of this version I tried to apply the patches to the src-download of freeimage by hand and found it working. So the update was pretty streight forward using the instructions for getting a pull request merged for homebrew.